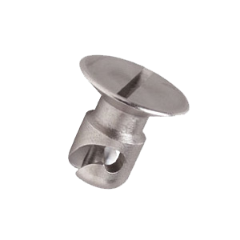 * Unlike the modern standard FJ series studs, the edge of the FA fastener's head is rounded just like the 1940's era studs used on so many warbirds and antiques. When an aircraft is competing for Grand Champion status, even the smallest details count and everyone is going to look at the cowling. These fasteners are a big enhancement to the overall appearance for just a little cost! These retainable studs are flush (countersunk) head, stainless and passivated as per AMS2700 to prevent corrosion. They are silver in color with a bright, shiny finish and are DFARS compliant. Additional sizes, materials and finishes are available upon request (minimums may apply). If you have any questions or need technical assistance, please Contact Us for details, we will be glad to help. *Note: New flare grommets are required when installing new studs. Make sure you get new grommets!